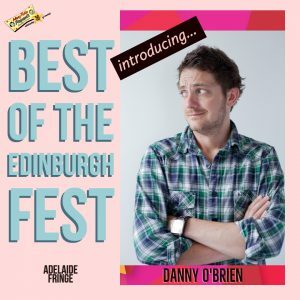 YOU MET HIM LAST YEAR… and he’s BACK, with his Irish charm and suitcase full of Guinness (well, not really)… It’s Danny O’Brien! The beaches and it’s epic food market! Favourite coffee spot in Adelaide? The Grind @ Central is great. Best meal you’ve had in Adelaide? Hard to pick, But I had an absolutely incredible Yum Cha meal in ‘Ding Hao’ last year. Best pump up song before you head to a gig/on stage? Do you have any pre-gig superstitions/traditions? A very wise promoter years ago told me to “Iron my shirt, empty my pockets, and be f*cking funny” before going on stage. It was sound advice that I have taken to every gig since! Go-to meal to cook when you’re on tour? I’ve a few, Red Thai curry if I can get the ingredients or anything with poached eggs! What song gets you on the dancefloor? Who did you idolise as a kid?